Messina the third largest city on the island located near the northeast corner of Sicily, at the Strait of Messina, just opposite the mainland. Founded by Greek colonists in the 8th century BC, Messina was originally called Zancle a word meaning sickle and reflecting the unusual curved shape of the harbour. In the Norman period Messina became one of the most important centres in Sicily and the Church of Annunziata dei Catalani is a splendid exemple. The Duomo, dating back to the Norma age, was rebuilt after the earthquake of 1908: its lofty campanile, an amazing structure, contains an extraordinary mechanical clock with a series of picturesque tableaux and automatic figures which creates an amazing spectacle when midday strikes. The tour of the city include the Regional Museum showing masterpieces by Caravaggio’s Nativity and The Raising of St Lazarus and by Antonello da Messina’s The Polyptych of St Gregory. Milazzo’s origins are ancient. Inhabited since 4000 BC (Neolithic) was ruled by the Greeks, the Carthaginians, the Romans then conquered by the Arabs who built here the first nucleus of the castle. Frederick II of Hohenstaufen further fortified the town and created here a personal hunting park. 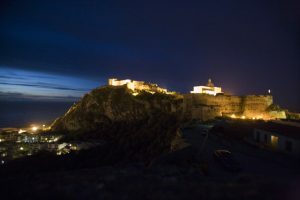 The castle was later mostly rebuilt in the age of Charles V of Spain. A walking tour of the historical district include the Arab-Swebian Castle, one of the largest in Europe in terms of size. We will drive along the foothill of the volcano to reach an altitude of 1,810 meters in an area called “Piano Provenzana” warped by the lava flow from the eruption on October 27, 2002. 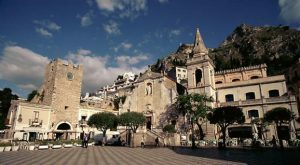 Proceed to Taomina, the pearl of Sicily. 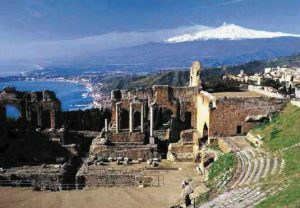 Founded by colonists from Naxos, the ancient Tauromenion, Taormina continued to rank as one of the more important towns of Sicily after the fall of the Western Roman Empire. It was taken by the Arabs in 902 after a siege of two years and the Muslim rule of the town lasted until 1078, when it was captured by the Norman count Roger I of Sicily. 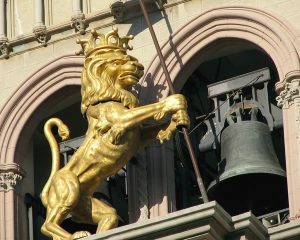 The town still retains much of its Medieval character intact. During the ‘50s and the ’60s Taormina enjoyed La Dolce Vita with famous celebrities from all over the world. the most remarkable monument remaining at Taormina is the Ancient Theatre, which is one of the most celebrated ruins in Sicily, on account both of its remarkable preservation and its beautiful location. From here we go up to 2,800 meters of altitude with special off-road buses (optional) following a track laced with vast, suggestive extents of lava and black lava sand along the chasms which opened during the eruption of 2002. At arrival, when the weather is fine and sky is clear it is possible to admire this extraordinary panorama that only Mt Etna can offer: the splendid mountains of the Peloritani, the Nebrodi and those of Madonie, the perimeters of which are surrounded by the Jonic and Tyrrhenian coastline, from the Syracuse to the mainland Calabria. At this altitude Mt. Etna offers one of the most breathtaking views in all the world! It is possible to observe, in the context of a typical lunar landscape, dominated by the Northern Crater, and on a clear day, from this point it is possible to appreciate the Leone and Bove Valleys below. The Bove Valley extends from north to south for about 8 Km, and from east to west for about 5 Km. Proceed to top boutique winery set on the north-eastern side of the Etna volcano, in the woods of the National Park and facing the sea of Taormina, representing one of the best models of Etna vineyards of high altitude: in an exclusive natural environment, at 900 meters above sea level, the vineyards lay on sunny and airy terracing that have a breathtaking panorama. At the highest altitudes the changes of temperature between night and day (which are considerable, up to 13-15°C in July and August) allow a phenol and aromatic ripening that is essential for the colour and taste of the red grapes and for the aroma of the white wines. Furthermore, the volcanic ground is very rich in mineral salts which supplies an equilibrated sugar content of the grapes and a proper relation between acids and alcohol. Their wines convey two different aspect of Sicilian oenology: the volcanic soil gives regional vines such us Nero d’Avola and Inzolia the perfect condition to ripen and to create soft, tannic sweet wins to be enjoyed young. 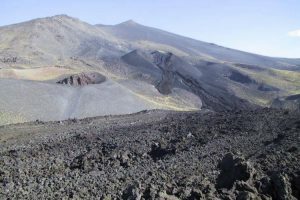 The distinctive environment of Mt Etna and from the use of autoctone vines such as Nerello Mascalese, Nerello Cappuccio and Carricante derive fresh and elegant wines.